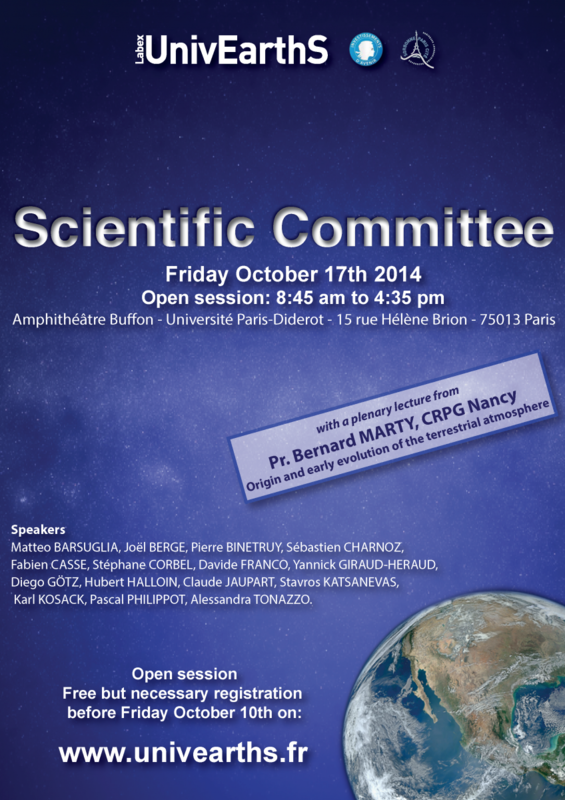 Labex UnivEarthS is pleased to invite you to its fourth Scientific Commitee on Friday, 17 October 2014. It will be held at the University Paris Diderot in the Buffon amphitheater at 15 rue Hélène Brion, 75013 Paris. The open session is held from 8:45 to 4:35 p.m.. Workpackage leaders will present progress of their work, on differents topics such as the formation of planets, the development of tools for the space or the evolution of life on Earth. We will have the honor of attending a lecture by Bernard MARTY from CRPG Nancy, Professor of Geochemistry at the National School of Geology and new member of UnivEarthS Scientific Committee. He will develop the origin and early evolution of the terrestrial atmosphere.